Enjoy the delicious taste of this creamy mayonnaise on-the-go thanks to these single serving mayo packets! 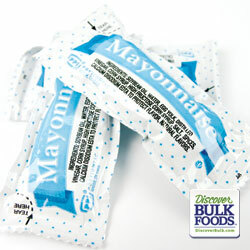 These mayo packets are perfect for picnics and parties as well as restaurants and other fast food establishments. Add these zesty mayo packets to any sandwich, salad or tasty side dish you desire. Each case consists of two hundred count. Ing: Soybean oil, water, egg yolk, distilled vinegar, corn syrup, high fructose corn syrup, salt, spices, calcium disodium EDTA to protect flavor, natural flavors. **Contains: Soy and Egg Ingredients. Product information/materials may change. Refer to the package or call for updates.